TRANSFER Consultancy is lead partner of the European LIFE environmental technology project The Green Deserts, in which 5 areas in Spain are reforested with over 55.000 trees with the help of the Dutch invention Groasis Waterboxx. This innovative tree planting concept helps young trees to survive in desertified zones without the need for additional irrigation. 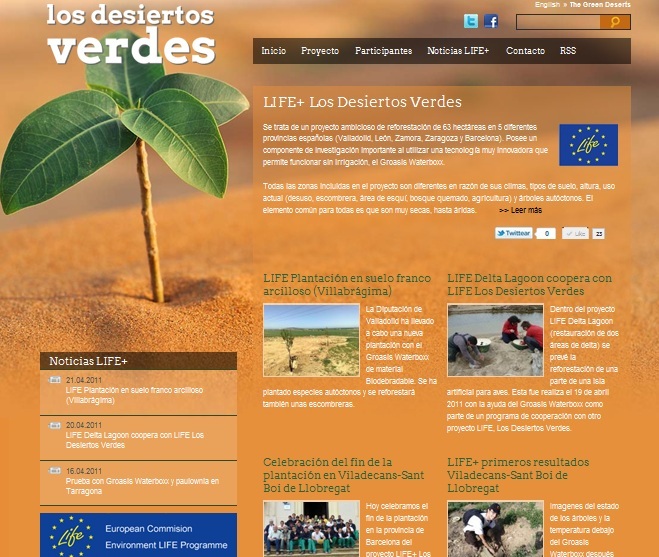 In February the website of the project The Green Deserts was launched in 2 languages, English and Spanish (Losdesiertosverdes.com). Recently, a series of articles, pictures an videos of the project were published. Also available through Facebook (Spanish). The results of the planting so far are very positive although the hot summer still has to start. For more information, please contact us through the form or phone: +34.93.272 47 90.